Although Aspirin hasn't been formally approved for veterinary use, it is sometimes suggested by veterinarians for dogs who are suffering from minor aches/pains, or who have an injury causing discomfort. However, you should NEVER give your dog aspirin without first consulting with a veterinarian. Puppies, pregnant dogs and dogs with certain health conditions should not take aspirin. Even if your vet gives you the go-ahead to give aspirin to your dog, it's vitally important to get the dosage correct, and to only use it as a short-term treatment. If you want to give Fido some aspirin for pain or discomfort, there are a lot of things you need to know before you pop that first pill in his mouth. Aspirin can have side effects which range from mild to severe (even life-threatening), and it's important to understand how this drug works and what safety precautions you need to follow. Aspirin is primarily a pain-killer. It is also a blood-thinner which means it reduces bloods' ability to clot. Aspirin can relieve pain effectively, and relatively safely, for some dogs, in some situations when specifically recommended by a veterinarian and used for SHORT PERIODS. Aspirin is made from acetylsalicylic acid and when used for an extended length of time it can actually destroy cartilage and end up making joint problems worse. Because aspirin also thins the blood it can make existing blood clotting disorders worse, or cause internal bleeding. Which Dogs Should NOT Be Given Aspirin? There are some health conditions which can interact with aspirin in a dangerous, even fatal, way. If your dog has any of these issues, please do not give him aspirin without consulting your veterinarian first. Regular 'people' aspirin formulas shouldn't be given to a dog for more than 5 days maximum. Because Aspirin thins the blood, it's not a good choice for dogs/pups who have had surgery or an injury as it could cause more (or internal) bleeding, which could be very serious. Aspirin that has been specifically formulated for dogs is the recommended choice, but remember that these also have a recommended duration of use. To avoid the common side-effect of stomach or digestive system irritation, choose 'buffered' Aspirin tablets. Opinions vary on whether or not dogs are able to absorb the full dosage of medication from enteric-coated tablets. This is because it takes a long time for Fidos' stomach acids to break down the coating. It's then a double-edged sword really... the coating may prevent stomach irritation, but if it isn't properly digested the medication won't be fully effective. To avoid this dilemma buffered aspirin is the best option in my opinion because it contains ingredients which help to minimize the inflammation or irritation but still allows the drug to be absorbed properly. The absolute best choice when considering aspirin for dogs is to choose a buffered aspirin which has been specifically formulated for canines. Giving your dog the correct dose of aspirin is critically important because an overdose, even a small one, could have disastrous consequences. 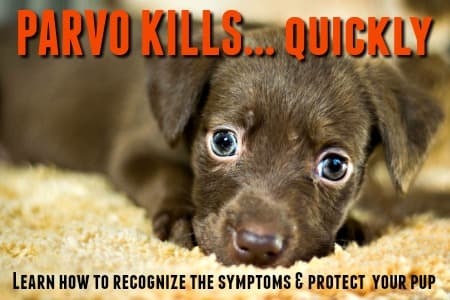 (10mg per lb is usually the maximum dose, but some veterinarians will go to 15mg per lb if they feel it necessary... but I would NOT suggest doing this without your vet's specific approval). Anything over 30mg per pound is considered toxic & deadly! It might help to know that a standard adult Aspirin tablet is 320mg and a baby aspirin tablet is usually 80mg. Aspirin formulated for dogs is available in different dosages. For small breeds you often see 60mg tablets. For larger breeds 300mg tablets are common. It's very important to make sure that you get the dose right, especially when you're treating small/tiny dogs, and using low-dose tablets makes this easier to do. Do not give Aspirin to puppies. 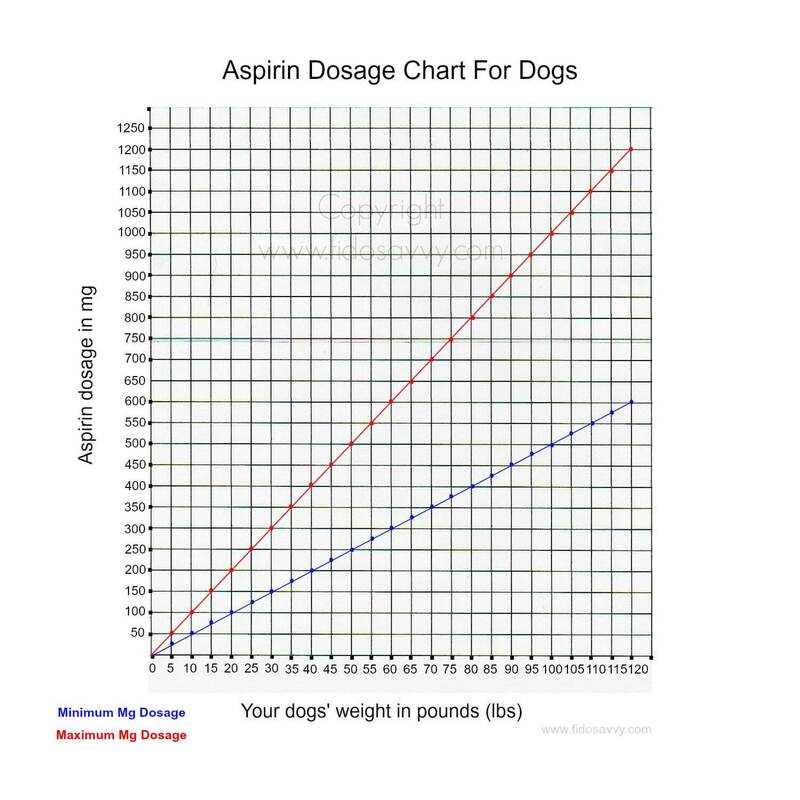 The chart below will help you find the recommended dosage of aspirin for your dog. The blue line is the minimum dosage (always start with this) and the red line shows the maximum dosage. Remember that these doses can be given twice per day if necessary. 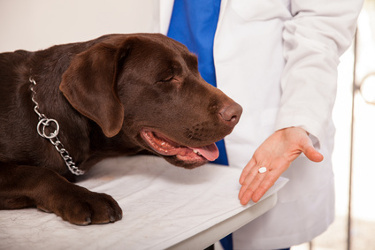 Before you give your dog aspirin, or any medication discuss the situation with your veterinarian first. It's also important to find out what's causing the pain or other symptoms that make you think Fido needs aspirin. Pain-killers will reduce his discomfort or pain, but they won't fix whatever is causing that pain - and that's something your vet will need to investigate and treat. For most dogs there shouldn't be any appreciable side effects of giving them aspirin for a few days as long as you keep within the recommended daily dosage above. Small or tiny dogs, and young puppies are at the biggest risk of problems and you need to be especially careful about measuring out the correct dosage (this of course applies to ALL medications) for your dog in these situations. Aspirin has the side-effect of interfering with the blood-clotting process and is irritating to a dogs' stomach. The side effects of giving aspirin to dogs are usually seen in the digestive system, but it can also affect the kidneys and liver which are involved in breaking-down and excreting the drug. The more dangerous side effects of using aspirin for dogs occur when the lining of the stomach, intestines or bowel is irritated or damaged. This can cause pain and internal bleeding. Organ damage is also a possibility, especially with long-term use, maximum dosage or overdose. These symptoms are very serious, so please get your dog to a vet right away if you notice any of them! If you give too much aspirin, or doses too close together there is a risk of organ damage. If this happens STOP giving him the medication IMMEDIATELY and get him examined by your vet right away. You can help minimize the digestive irritation caused by aspirin by making sure that you never give it to your dog when he has an empty tummy. It's frighteningly easy to give your pet too much aspirin by mistake - either by miscalculating the dose or giving it too often. 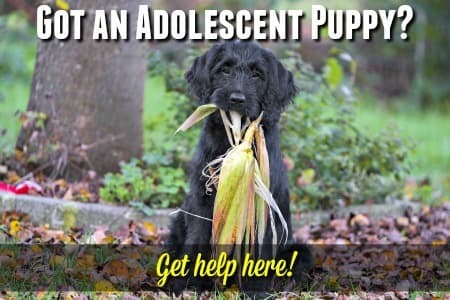 Even a little too much can cause serious problems, especially in young puppies, small breeds or senior dogs. The ASPCA Animal Poison Control Center or the Pet Poison Control Helpline can give you advice but hands-on vet care is likely to be needed. Available 24/7. There may be a $65.00 (payable by credit card) for the call. The APCC mobile app gives you life-saving info. in the palm of your hand. In an emergency every second counts. Click here to learn more or download this app: ASPCA Animal Poison Control Center Mobile app. Available 24/7 Charge is $49 per incident (payable by credit card) which includes initial call and any follow up calls on the same case. If you realize that this has happened, you need to get veterinary help immediately or your dog could die. If your regular vet clinic is closed, get him to an emergency pet hospital or 24 hour clinic. 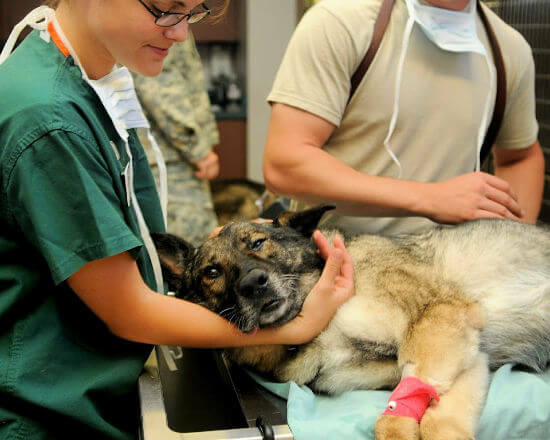 Prompt vet attention and the right treatment could save his life. Several of the signs of aspirin poisoning can also be normal side-effects which are short-lived and not dangerous, but if you're in any doubt always get vet help. Better safe than sorry. Because of this, it's crucial to monitor and double-check dosage at all times. Blood tests can be used to determine the level of aspirin toxicity in your dogs' body. This knowledge is then used to decide what treatments are needed. There is an approximately 12 hour 'window' to get veterinary treatment started after an aspirin overdose before symptoms become severe, and potentially irreversible. This is why it's important to be vigilant about monitoring Fidos' intake of aspirin and any side-effects he may experience. Your vet may induce vomiting and/or pump your dogs' stomach to remove as much of the aspirin from his system as possible. But of course, anything absorbed into his bloodstream can't be removed in this way, which is why you need to get help for your dog asap. If any organ damage, stomach ulcers or damage to the intestines has taken place then surgery or other options may be needed. Blood transfusions, IV fluids and other treatments might also be used. If your dog needs pain relief and you want to try a more natural product before jumping right into medication, FlexPet might be the perfect fit. FlexPet is not a pain-killer, but is a nutritional supplement packed full of all-natural, non-GMO ingredients designed to improve your dog's joint health. These chewable tablets lubricate joints, reduces inflammation, boost flexibility and help rebuild healthy cartilage and connective tissue. Clinical trials have shown that the active ingredient in Flexpet, CM8, reduces pain and inflammation in dogs with arthritis. In addition, reviews from dog owners are almost unanimously positive, making this a very viable Aspirin alternative for pain relief in dogs. Alternatively, a product which contains Turmeric (the natural source of the chemical compound Circumin) can help reduce, or even eliminate, joint pain and stiffness. Bacon and Beef Liver flavored chewable supplements made in the USA in a GMP certified organic facility. Hypoallergenic formula. Also benefits your dogs heart, brain, immune system and liver, and promotes healthy skin and coat condition. There are several other human medications which are routinely prescribed/recommended by veterinarians for the treatment of a variety of dog health conditions. It's important to get the dosage 100% correct for your dog and never to give any medication without first consulting your vet. You can also find out the correct dosage for a wide variety of medications that your dog may be prescribed, including OTC products.